We got a relaxed start today to ease into the day after what Becky went through last night (Update: we found out Angelynn unintentionally gave Becky a prescribed sleeping pill!). She only remembers bits and pieces from last night. So crazy that whatever she took was that strong on her to completely drug her like that. I’m so glad that Angelynn and Heartbreaker were there and that we landed in a nice place. The groundskeeper told us we could take showers there and it was heavenly. The two of us decided to hitch back the 5km to where we left the road walk yesterday. Heartbreaker chose to hike on from where we were. Angelynn has a job interview in couple days with the United Nations (she’s a lawyer that specializes in the international laws of the sea) and hitched into Hamilton to prepare. We will see her in a couple days. It’s pretty great the range of people you can meet on a thru-hike. I’d never be spending this amount of time or possibly even crossing paths with this group in “real-life.” I love how thru-hiking brings together such different people into one community. 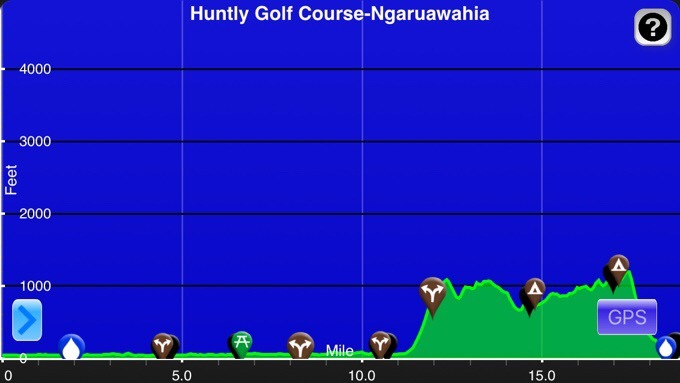 So our first half of the day was a relaxed road walk into the small town of Huntly. The actual track ran on the stop bank that paralleled the road, but we chose to just take the road. If I can see the trail right parallel to me, and I know it’s crappy trail (tons of mud, tall grass, stiles, and divots in farmland) I have no problem walking the road next to it. This is another example of a stretch many would just hitch around. It was a very relaxed morning and we enjoyed the walk. We felt no need to push today and were really relaxed. Becky was still a bit groggy and I was slow to warm up today too. We enjoyed it with no headphones needed. Just each other for entertainment and nice farmland views. 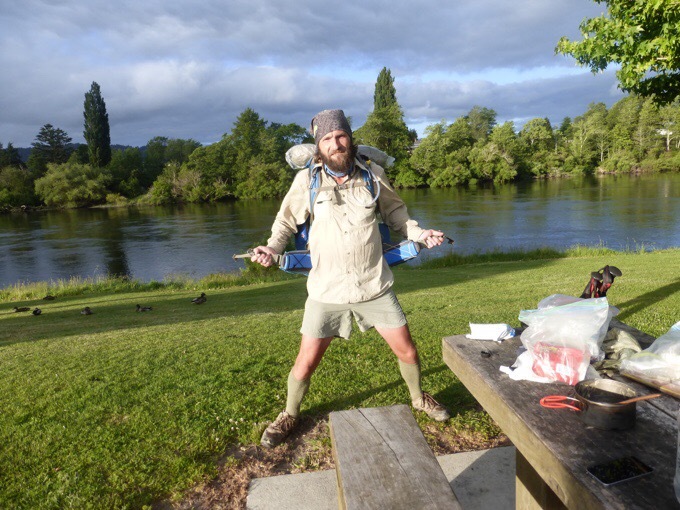 We came into Huntly and took a side trip to cross the bridge over the Waikato River, to the grocery store for one more day of food. 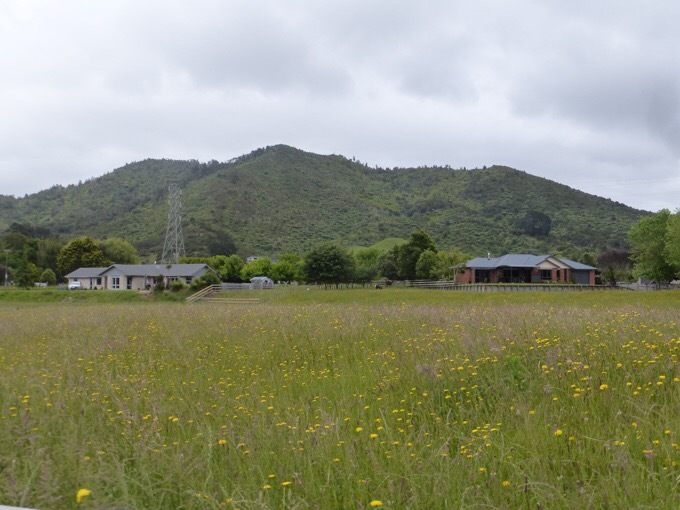 We’ve been along the Waikato for two days now. It’s the longest waterway in New Zealand. Once again, Becky impressively resisted the pull of a soda. She thinks she will only indulge in a soda in our real town stops, not just the countless small stops between them. 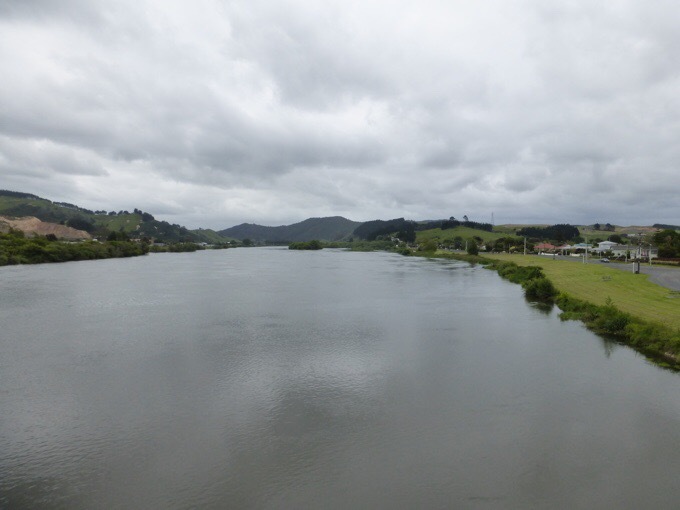 Waikato River with the Hakarimata Range ahead where we are headed. 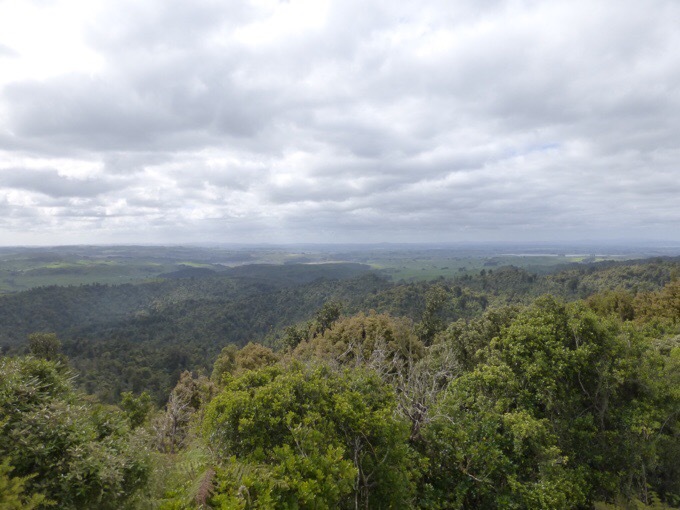 About an hour out of town was the challenging second half of our day through the Hakarimata Range. It was a forested section that was predicted to take quite awhile to get through. With the estimated time description given in the notes, we weren’t even sure if we’d get through the forest tonight. It was 7mi/12km and it was just about 1pm, so we had hope, but were realistic and took water in for overnight if we didn’t make it through. 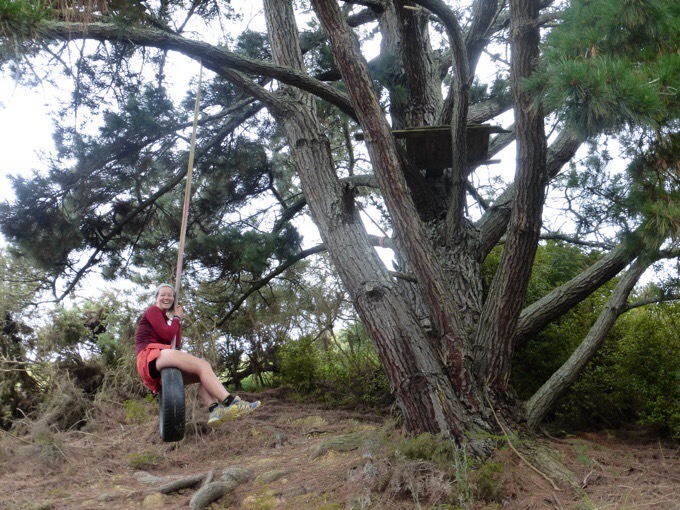 Just before the climb was a cute little tire swing up off the road under a great tree. We ate lunch there as it misted outside on and off and it was a great spot in pine needles overlooking some nice farmland. 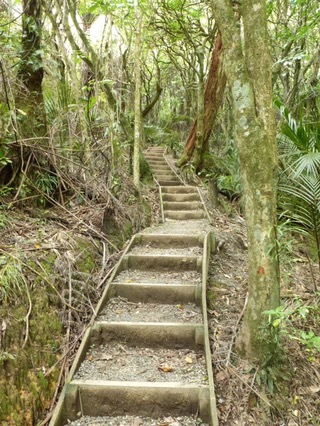 We knew the climb up and down from the forest had a ton of steps on each side. 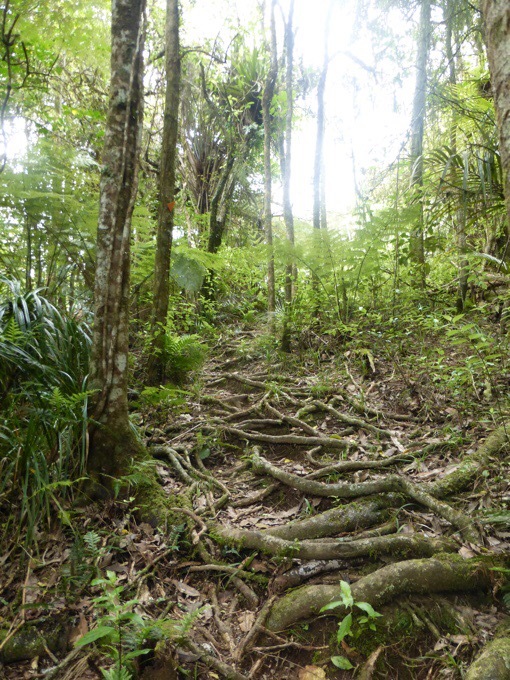 The uphill side had 1,349 steps. It turned out to be a great day for it and the steps are so much better than a muddy slip ‘n slide! It was overcast with a breeze and cool. 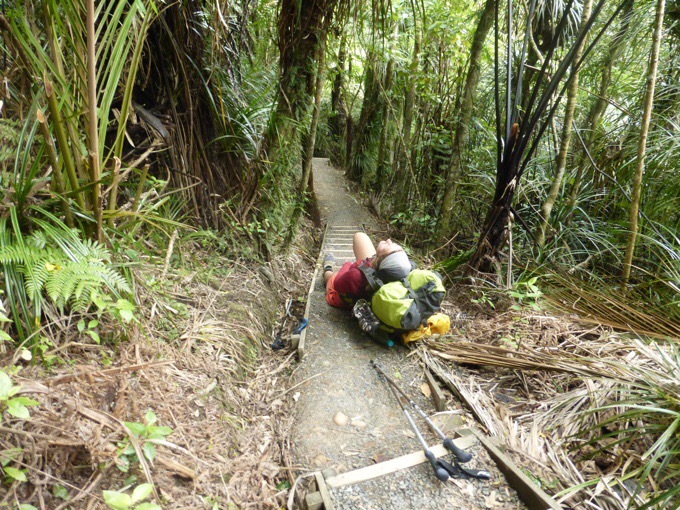 The walk up was more gradual and not as bad as we anticipated. There were many viewpoints and it was great. 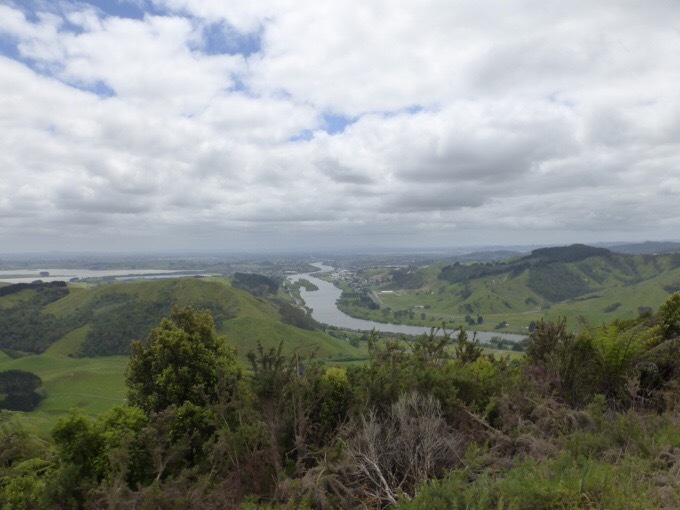 We could look back and see Huntly, the Waikato River, and where we had come from. A break on the way up. 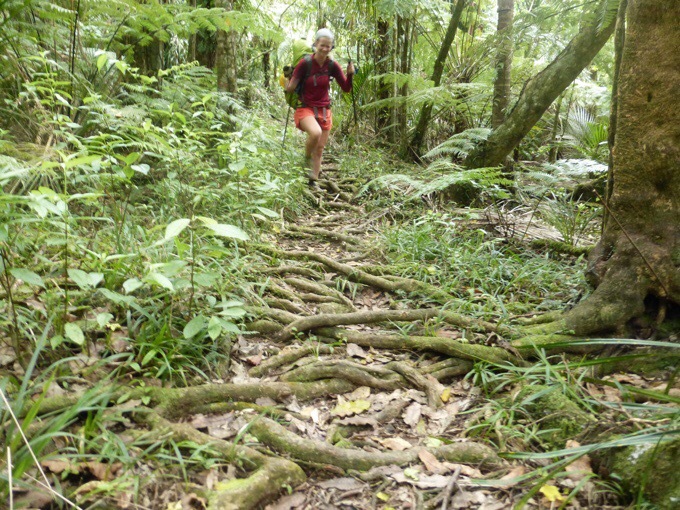 Once we got to the top, the stairs disappeared and the roots came as we traversed the range with short ups and downs along with nice flat stretches. 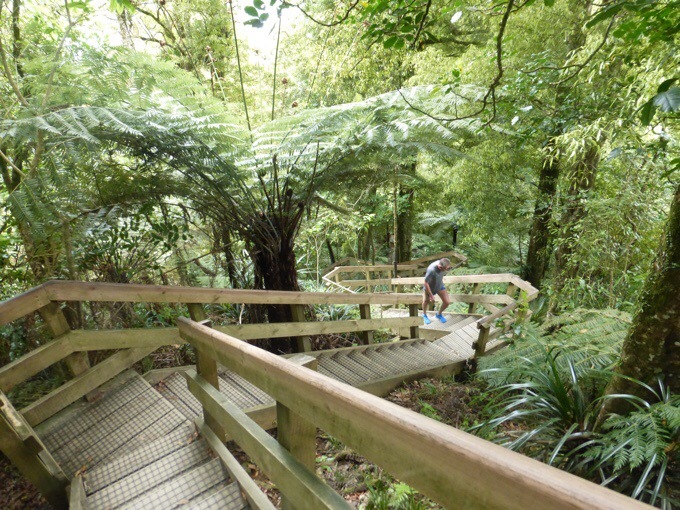 I absolutely loved this forest and Becky enjoyed it too. It felt magical and peaceful. It was a bit time consuming with the roots and some mud, but we didn’t mind. It was less dense and brushy than what we’ve been in thus far and we were able to take it in and appreciate it. It really was the best forest so far. My poles have not been perfect in these forests and one likes to collapse slowly. I think it’s all the mud in them and I need to give them a good washing. Becky commented on how impressed she was with hers (Black Diamond Z-poles that fold up) and that they’ve held up. 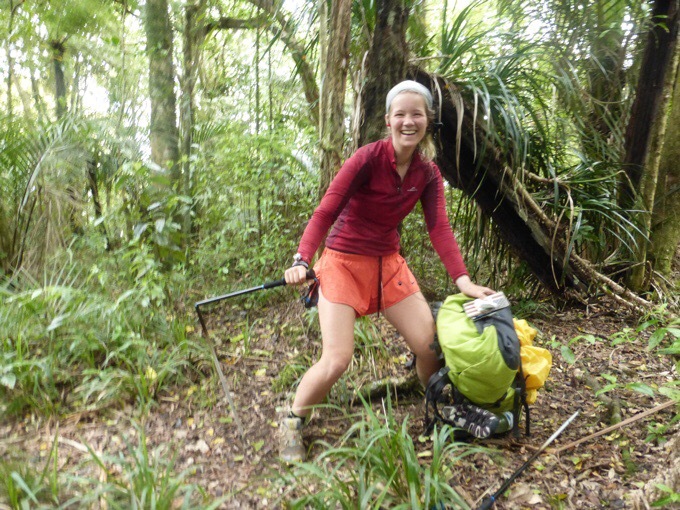 Of course, halfway through the forest, one of Becky’s poles had a piece come loose and it kept coming undone. Dang it! We are going to try a repair in town, but she may need to get a new pole. They are pretty essential in these forests. Not the most useful hiking pole. As soon as we hit the final peak, there were a ton of runners. It was so great to see! It was just after work hours, so tons were there for their daily workout routine. They would run (if they could) up the steps and back down. It was energizing and motivating to see so many doing their daily workout and how intensely some of them were doing it. It just made us happy to see so many outside and in the forest. What a workout routine! 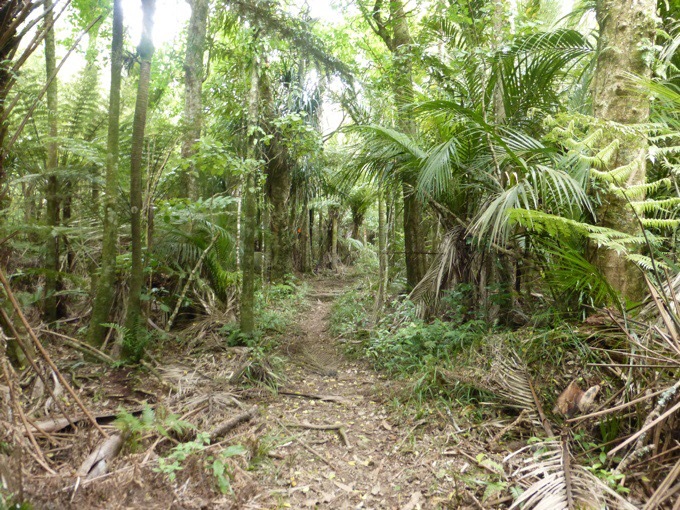 Once at the bottom, we considered going up a side road into the forest to camp. A local said to just camp in the park in town that’s along our route and that it’s really relaxed here so it’s not a problem. We walked a bit further to the park and it’s right on the river with a great view. Three camper vans were parked there and we asked if it was legal to camp as well. There weren’t any no camping signs that we found, so I called the local police and parks system and got the ok. Yay! Heartbreaker had been in town at the library updating his blog (it’s in German) and came to join us. Goofy Heartbreaker can’t just take a photo without doing something. We are right next to a parking lot, but it’s a great view with a picnic table overlooking the river. We got to watch teenagers on the long row boats training and it was fun to watch. Now that it’s dark, we realize Becky and I mistakenly pitched directly under a street lamp, ugh! We had to laugh as it was so bright it’s like sleeping with the lights on. Plus, the electric toilets so prevalent out here lock after 8pm. As I lay here, we are laughing that we can hear tons of cars, a bi-hourly train goes over the river nearby, dogs are barking at neighboring properties like crazy, there are locals in the park making noise, and a baby is totally screaming in one of the camper vans next to us. 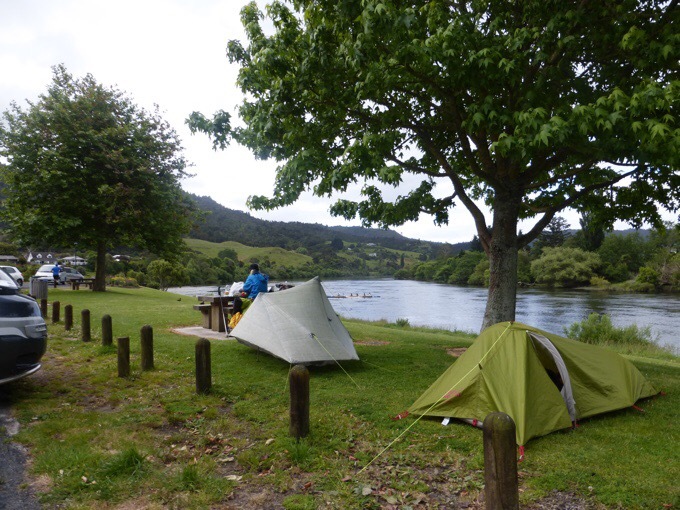 Just another classic camp spot on the Te Araroa! Having said that, today was one of our favorite days so far. One more day to Hamilton and a really relaxed zero! 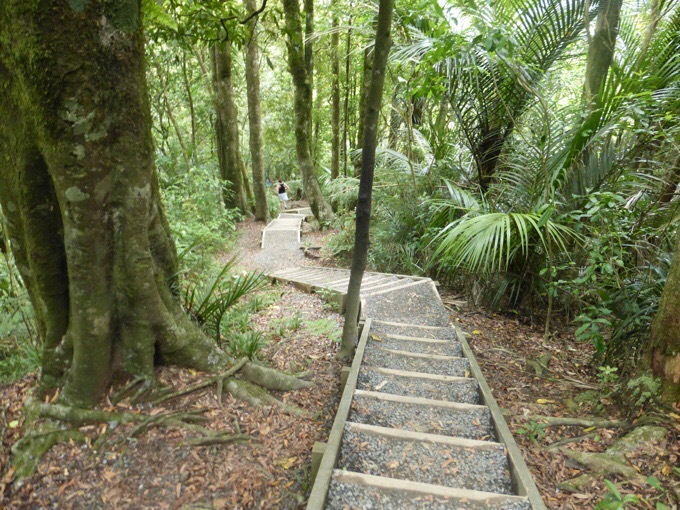 Seeing all those people climbing stairs made me wonder: since they drive on the left side in NZ, do they also use the left on stairs/trails? I’m so habituated to using the right side of stairs, I’d probably run into a few people before I figured it out. So impressed with Becky .. tell her from me that she is a Proper Walker – especially so, if she is keeping pace with you, Erin! 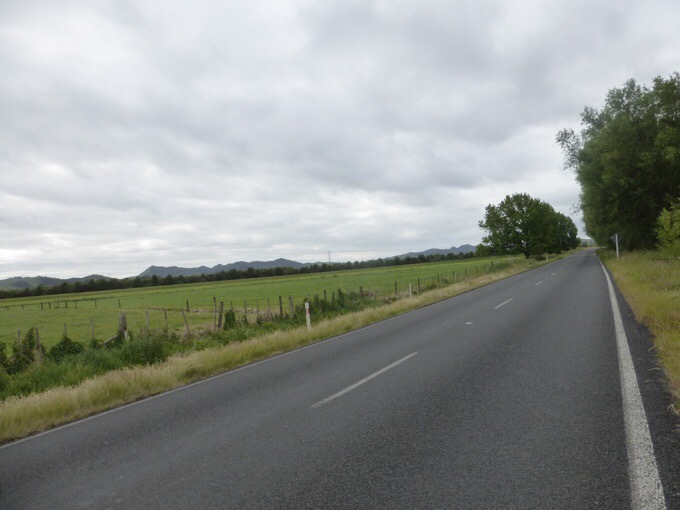 Judson… in the UK people walk on the right even though they drive on the left. Makes no sense to me. Judson, here in the U.K., on the London Underground escalators, we stand on the right and walk on the left. In Australia (well, in Perth, anyway) they stand on the left and walk on the right on the subway escalators. I’ve always assumed it’s something to do with being in the Southern Hemisphere…water going down the plug hole the opposite way etc…? It has been confusing and is a good question! In the grocery stores, they are definitely on the left. We stepped to the side on this trail for those running up, but I feel like left is also the way people tend to go. Actually, Becky is quite the keeper! We just overhauled her whole kit and she is walking out of town as a lightweight thru-hiker. I may not be able to keep up now! Felix is still in touch and a couple days back. Driving on the side of the road you are not use to is usually not a problem, until you have to negotiate a roundabout, then you really have to concentrate! Quite amazed at the pace that Wired and Becky can keep to. Even on terrain that is not particularly difficult I find 20-25kms a day is enough. You are both very quick setting out in the mornings. Do you have breakfast ? I find the breakfast and packing up routine takes up 90 minutes each morning. I’m the same. I have a routine and it’s always 90 mins but I wouldn’t get far without breakfast. We both aren’t big early morning eaters. We eat bars as we walk in the morning. That does help with timing and getting out quicker. Love morning hiking and it gets light here early with birds as nature’s alarm clock. “We enjoyed it with no headphones needed. Just each other for entertainment and nice farmland views.” Lovely line Erin. Finding those moments is what it is all about. Those moments.. And those people.. Seems like you And Becky meeting up has been a big win for each of you.